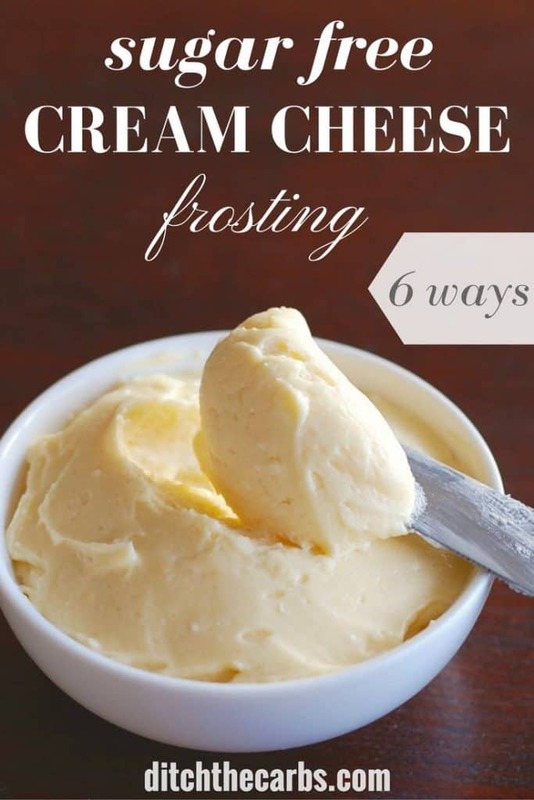 Sugar Free Cream Cheese Frosting - 6 ways - the best frosting EVER!! Have you been looking for a sugar free cream cheese frosting that’s easy to make and adaptable enough for almost any flavour? Well this is your lucky day, you have found it. 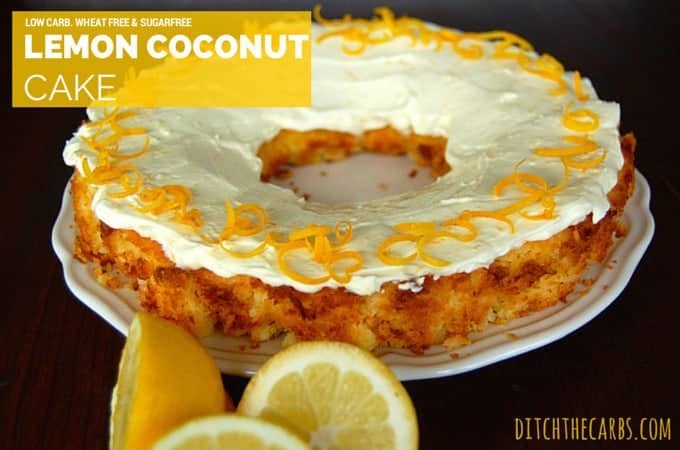 And with only 3 ingredients and 6 variations, this is a keeper! I first started low-carb baking without any frosting/icing, then as time went on I wanted a little something special to top off cakes, cookies and cupcakes. 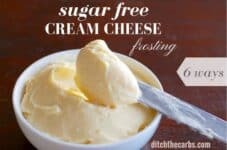 This incredibly simple sugar free cream cheese frosting is so versatile. So far I have made the following flavours with great success. Let me know what flavour you would use. Brandy – add 1 – 2 teaspoons of brandy depending on how boozy you like it. This is a superb version for Christmas time and Christmas cake. Always keep this recipe on hand. There are 6 variations of sugar free cream cheese frosting, which will you choose? Gently mix the softened butter, cream cheese, sweetener and flavourings until smooth and creamy. My favourite recipes to use sugar free cream cheese frosting. Is there any other sugar free powdered sugar as I find the Swerve one leaves a strange feeling/taste in your mouth. I really do not like it at all. I use a variety of them. you can see them all in my Amazon Low-carb and Keto Shop here. Regarding the powdered sweetener. Did you use the kind that measures equally with regular powdered sugar? I used only 1 teaspoon of powdered Sweetleaf Organic Stevia. Because it is says 1/10 tsp. (0.4g) = 1 teaspoon of sugar. Anyway it tasted funny. Either not sweet enough or that aftertaste you get from artificial sweeteners. All my recipes here use a sweetener that measures spoon for spoon in place of sugar. I also add in each recipe notes, that sweeteners should be added to YOUR taste. And remember to taste after each addition. Stevia can have quite a bitter aftertaste or metallic taste if you add too much. I like erythritol or a mix of stevia/erythritol. 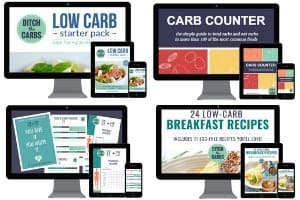 You can see which sweetener I use by looking at my Ultimate Guide to Low-Carb Sweeteners. Hi, salted or unsalted butter? Thank you! I use salted butter in all of my recipes. Our butter in NZ is mildly salted it would appear, compared to some countries. Does the frosting freeze well? Sorry, I have never attempted to freeze it. I would imagine it would freeze well in an airtight container. Why is everyone using grams now as measurements! I would rather see Tablespoons, cups, whatever! Simply press the red buttons below any recipe, and you can switch between metric grams, or cups and tablespoons etc 🙂 Use whichever you prefer (but metric is so much more accurate, to help avoid costly measuring with cups). Metric is used throughout the world, by all but like 3 countries and it is a much, much more accurate scale for measuring. I have found that it’s better to just get a decent kitchen scale and measure it out, so it comes out just right. i LIVE IN AMERICA AND PREFER TO USE THE SAME MEASUREMENT I HAVE USED AS LONG AS I HAVE BEEN COOKING AND i DO NOT BELIEVE IT IS ANY MORE EXPENSIVE THAN USING THE METRIC SYSTEM I DON’T NEED NO SCALE TO FIGURE HOW MUCH A CUP IS AND I THINK MOST AMERICAN PEOPLE WOULD AGREE. Different items weigh different amounts in a cup. That’s why they say Metric is more accurate. I’ve tested the difference on a good scale and there IS a difference. I’ve always used the old fashioned way to measure living here in the US but after reading these replies, I think I’ll switch and see for myself since all this KETO stuff is expensive… Have a blessed day. I agree ! I bake with American measurements. I always have and always will. I would like to make a chocolate cream cheese sugar-free frosting. How would I change the recipe? I would either add melted chocolate, which would turn this into a lovely ganache (make sure the cream cheese isn’t too cold otherwise the chocolate will harden when mixing), or add some cocoa powder and possibly a teaspoon or two of double cream to soften the frosting. The cocoa will make the frosting a little too firm. I was thinking of making this for single serving use. How long does it keep in the fridge? I would keep this in the fridge for up to four days. I just tried it with spreadable original cream cheese. It tastes quite salty and not very good. You didn’t specify which type of cream cheese? was I meant to use the light? or what I meant to use the block? thank you. The recipe does state full fat cream cheese and there is an image of the cream cheese block below the recipe, just to be sure. Throughout my website I recommend only to use full fat cream cheese as the spreadable and light versions often have higher carbs or other added nasties 🙁 . It appears the spreadable cream cheese you used had salt added. Always add sweetener to your taste as we all have a differing sweet tooth 🙂 I’m sure you’ll have better success next time. 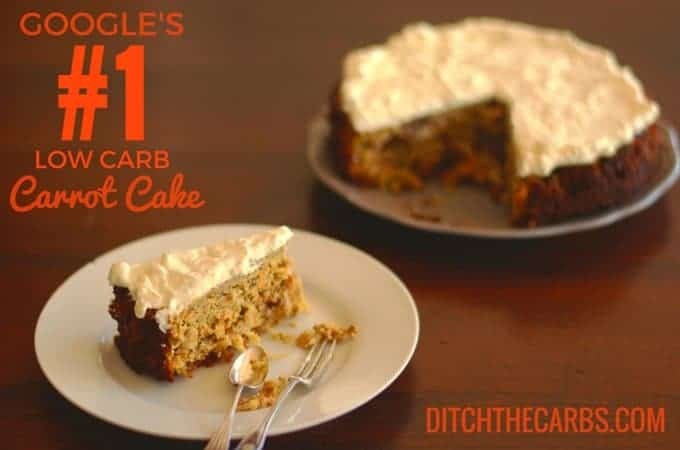 It really is a good low-carb frosting recipe to use on almost anything. 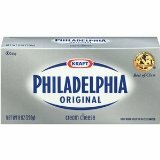 use the normal block of cream cheese in any keto recipe using cream cheese and use the full fat version. Does this turn out stiff enough to use a piping bag to make designs? Yes. You can also easily adjust the consistency by adding more cream cheese (to make it thicker) or more melted butter (to make it thinner). Even a few drops of double cream will change the consistency if it turns out too thick for your piping bag. It didn’t work for me. Now what do I do? I’m going to add milk so it will be easy to spread. Nothing should go wrong with mixing cream cheese and butter. Did you use spreadable cream cheese perhaps? Melted them too high? What a superb idea however to add milk (or cream would be lovely too) and turn it into a spread. Yum. I was excited to find this recipe. Made it tonight and used it. I made it exactly as the recipe stated and it’s like eating a stick of butter! In fact, it’s so greasy it slides off the cake! I will try it again using half a stick of butter and a full eight ounces of cream cheese. I fully expect that to be delicious. NZ butter is a high grade than typical American butter. I have a few recipes passed on from generations of farm family members, where they made the butter- they cant be made with typical American store bought stuff. In US buy Amish butter, Kerry Gold or some other form of super high fat/high grade butter. Otherwise it will be greasy and not mix up well. Just speaking fro experience with family recipes- using fresh farm products from Michigan and Ohio farms. Can you use maple syrup or honey instead of a powdered sweetener?